Last June I reviewed Twistos Baked Snack Bites and found them so addicting and loved how the flavour pops with each crunchy bite. 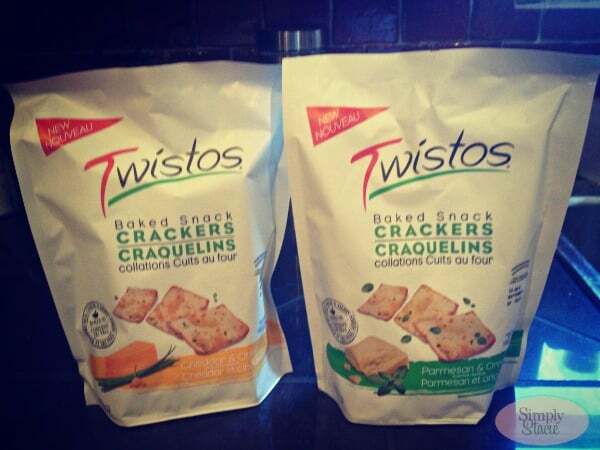 PepsiCo recently contacted me asking if I would be interested in trying out a new flavour in the Twistos Baked Snack Bites family as well as their newest creation: Twistos Baked Snack Crackers. I think you know already what my answer was. The new flavour, Balsamic Vinegar & Olive Oil is my favourite out of the four. It’s got just the right amount of vinegar taste and is not overpowering like some salt & vinegar type chips can be. Now these ones are really addicting! John likes to eat his like a bag of chips. Out of all four flavours, he prefers the Bruschetta and Parmesan & Garlic. They are smaller than a chip, but with about the same amount of flavour. Grab a bag of these instead of reaching for the popcorn or chips on your next movie night! 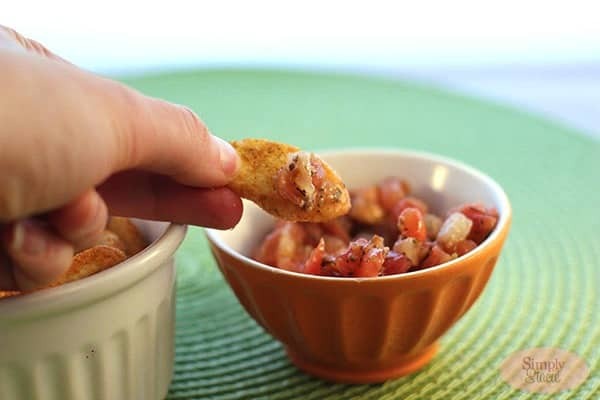 The Bruschetta Twistos Baked Snack Bites are delicious served with real Bruschetta. Just scoop a little on each bite and enjoy. The Parmesan & Garlic Snack Bites I served with a White Cheddar & Parmigiano Dip. Add them to your salad instead of croutons. 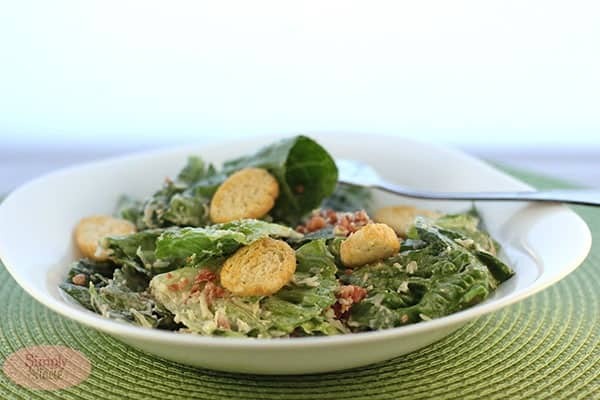 Here I added the Parmesan & Garlic flavour to my Casesar salad. Yum! 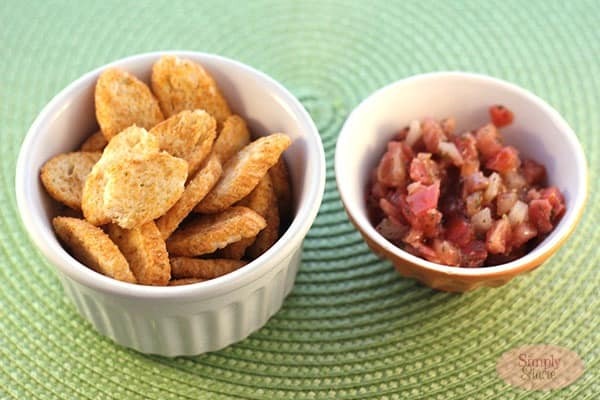 Twistos Baked Snack Crackers are the newest product in the Twistos line. They are available in Cheddar & Chive and Parmesan & Oregano flavours. They are light, crisp & flavourful. The Cheddar and Chive are my favourite. I eat them mostly on their own as a quick snack to quench the hunger pangs. We also like to eat cheese and crackers as a snack. They would also be delicious with a little cream cheese spread on top. 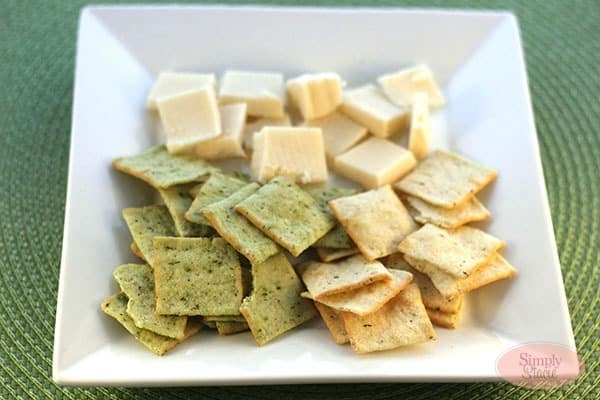 The Cheddar & Chive are on the left and the Parmesan & Oregano are on the right. 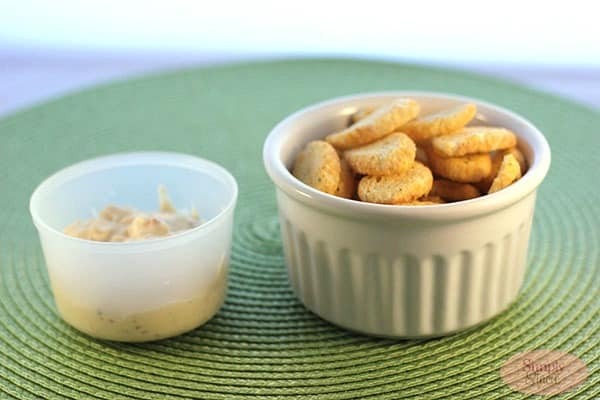 Both the Twistos Baked Snack Bites and Baked Crackers are less than 100 calories per 20g serving. 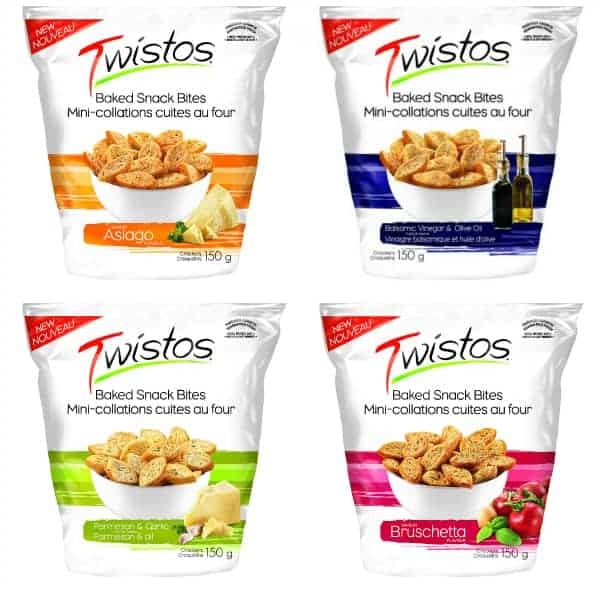 You can buy Twistos at all major retailers across Canada and they have a SRP of $2.69. Pick up a bag (or two) and try some of the suggestions above or create your own perfect snack! I would really like to try Parmesan and Garlic and I would like eat them just as they are! I like the Bruchetta flavour and would eat it with warm goat cheese dip. yum! Oooh I really wanna try the Balsamic Vinegar & Olive Oi. Id like to try spreading some brushetta ontop and then slices of a great melty cheese ooooh OR dipping it into baked brie! Yum! bruchetta with cream cheese yumm!! Add a piece of red pepper on top of the cream cheese! Your taste buds will thank you!